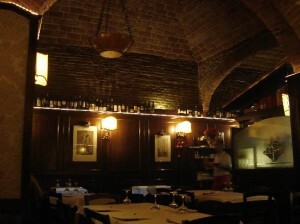 La Taverna dei Quaranta is a historic restaurant with parking in Rome Old Town. It is opposite the park of the Celio Via Claudia is very easy to find parking at all hours of the day. The tavern of the Forty also enjoys a wonderful location from a tourist point of view it is possible to see the Colosseum from his entry thus obtaining the title of restaurant near the Colosseum. The interior space is divided into three air conditioned rooms very large but with individual tables for special intimacy. Outer space is used to the service from the warm days of spring to late autumn. La Taverna dei Quaranta you will discover the true taste of typical Roman cuisine with pasta and homemade bread for a truly authentic taste. The menu includes all the typical Roman dishes seasonal offering fresh dishes and suitable to your palate. The restaurant is open every day of the week for lunch and dinner. You do not need a restaurant with parking Roma, no problem, you can reach us by the Metro B (Blu) at the Colosseo stop and then walk up to Via Claudia, 24 – 00184, Rome Tel. +39 06 7000550.